Feldman trained with, among others, Werner Drewes, Fred Becker and Stanley William Hayter. Her woodcuts are complex. She carves, paints, and prints her images from single panels. woodcut, quartet, 64 x 96"
woodcut, diptych, 48 x 64"
woodcut, 31 3/4 x 23 7/8"
woodcut, 23 1/4 x 24"
As subject the land creates a marriage of content and form. My work celebrates place, The work shifts from panoramic sweep to the aerial view, from the more descriptive cityscape with man made structures to the more naturally abstracted landscapes. I use light and how it exposes and shadows forms to create the shapes I carve in wood. The daily migration of light summons the concept of time passing. I rely on the shift of light and dark to suggest a sense of time beyond chronology. My technique is a non traditional Japanese woodcut print. My use of color is intuitive and underscores the sense of place. The forms are metaphors for life changes expressing cyclical ritual rhythms interfacing with water and land itself. "Aline Feldman: Images from Wood, a 30 Year Survey" looks back on an amazing career of a celebrated, award winning artist. Now 87 years old, Aline Feldman is still going strong, working daily in her studio. She is well known as a master of the white line woodcut medium. This exhibition begins with her very large scale prints from the mid 1980's, which rival the size of paintings, and concludes with more intimate scale images from a series begun last year. The artist has been represented by the Marsha Mateyka Gallery since 1988. A catalogue will accompany this exhibition. Aline Feldman prints with watercolor from a single block of wood to create woodcuts of city views and landscapes using expressive color and exuberant forms. Her prints are often panoramic, aerial views. This perspective flattens her images, which are based on actual places, and frees her to follow abstract shapes, patterns, dynamic rhythms, and color contrasts. This exhibition includes an outstanding example of this early style, "Afternoon Sonata" (1988), a 4 part woodcut measuring 64 x 96 inches. Aline Feldman's prints are in numerous museum collections including Nelson-Akins Museum of Art, McNay Art Museum, Honolulu Academy of Art, Santa Barbara Museum and in Washington DC; Smithsonian Museum of American Art, National Museum of Women in the Arts and Library of Congress. *Acton, David, "60 Years of North American Prints, 1947-2007," published by The Boston Printmakers, MA, 2009, p.140. ** Arnold, Dr. Karen L., "Perspective, Place, Prints: The World of Artist Aline Feldman" p.2. Museum Duxbury, MAThe Boston University Art Gallery (BUAG) will host an exhibition to celebrate the 60th Anniversary of The Boston Printmakers, February 9 - April 1, 2007. The exhibition will highlight the work of local, national and international printmakers, as well as educate the public about the field of printmaking since 1947. To mark the opening of the exhibition, a reception was held at the gallery on February 8. Aline Feldman studied art at Washington University in St. Louis, where among her notable teachers were Werner Drewes, Fred Becker, and a visiting Stanley William Hayter. During graduate school at Indiana University, Bloomington, Feldman studied Seong Moy. All of these artists are great printmakers in addition to their work in other media. For Feldman, prints, it seems, were an inevitability. But an early desire to focus on painting led the artist to a unique solution: white-line woodcuts applied with brushes and watercolor allowing for a range of colors, shapes and forms. Together these elements allow the artist to convey the energy, movement, and life that are the heart of her art. From her schooling, Feldman gained proficiency in Western methods of woodcut. But her mature style takes a bit of the Western method adds a bit of Japanese methodology, and a bit of white -line woodcutting to a body of work that explores nature in all its glory, in all kinds of weather and times of day. In the early 1960s Feldman and her husband, Arnold, moved to the Washington, D.C. area, where she met Japanese master printmaker Unichi Hiratsuka at a Georgetown gallery specializing in 20th century Japanese woodblock prints. With him Feldman learned the art of multiple block printing in colors. 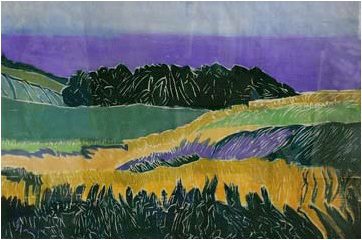 Finding this technique limiting, Feldman added the white-line method of woodcuts, which had been popularized by the Provincetown printmakers at the beginning of the 20th century. A voracious visual person, Feldman has lots of images floating around in her mind. She also has an extensive archive of sketchbooks and photographs taken from above in hired Cessna. Sometimes ideas percolate for a year or more before she makes a large-scale preliminary drawing, working out the composition. Tracing the image on a piece of thin tissue paper, Feldman glues it to a piece of wood, carves the design, and washes off the tissue. Laying a piece of Okawara paper over the image, Feldman anchors the sheet using river rocks. Flipping the paper back, watercolor paint is brushed onto one section of the woodblock at a time. The paper is laid down over the colored area and Feldman uses a baren to burnish the back of the paper causing the color to transfer from the wood to the paper. The step is repeated several times to get the density of the color desired. Galleries: "Nothing plain about Feldman's panoramas"
Woodblock or woodcut printing developed in Asia and Europe, but in recent centuries its most artistic forms are associated primarily with Japan. So it's hardly surprising to discover that Aline Feldman, whose work is at Marsha Mateyka Gallery, studied with Unichi Hiratsuka, a Japanese printmaker who spent time in Washington. But the prints in "Landscapes/Cityscapes: Images From Wood" take Japanese techniques in new directions. 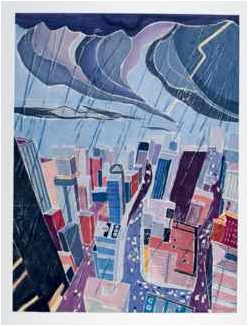 Feldman uses watercolor, not ink, to make large monoprints (one-of-a-kind images) of mostly imaginary urban and rural scenes. She carves a single block, rather than individual ones for each color, and applies different pigments to various portions of the carving at separate times. This requires superlative precision, but the exacting technique doesn't seem to limit Feldman. She also sometimes allows the wood's grain to show in the finished piece. Thus, "images from wood". This selection includes a view of a stretch of Connecticut Avenue that's a short walk from the gallery. The other prints, however, depict less-specific places, although sometimes with a recognizable feature – such as the Brooklyn Bridge – inserted into the composition. Several of the works are in Feldman's long-running "Paradox of Place" series, which jumbles locations in a slightly disorienting way. The artist doesn't seek to unnerve the viewer, though. With their bright hues, sensuous lines and humorous touches, these non-places are entirely inviting.